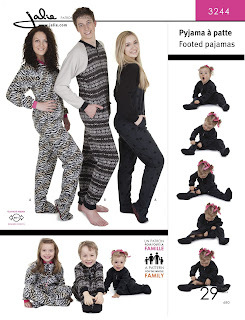 My daughter has been asking for some footed pajamas this winter. I immediately thought of Jalie 3244. After looking at the number of pattern pieces and corresponding illustrations and instructions, I thought this might be a challenging project. I didn't exactly want to jump into this, thinking that it would take me a long time to make. I was pleasantly surprised at how quickly this came together! It does take a while to trace and cut out though. I mostly used my serger. Since the fleece is thick, I basted each seam about an inch with my sewing machine to make sure that my fabrics fed through my serger evenly. The zipper was very easy to put in. You don't even need a zipper foot. I didn't use mine since you first baste the zipper to the opening fabric edge with a zig zag stitch. Once again Jalie instructions do not disappoint and the finished zipper was flawless. There are pockets in the side seam too! My daughter was really excited when she noticed them. I used a dark purple rib knit for the neck and sleeve cuffs. You can also make ankle cuffs too if you prefer to not have your feet enclosed. If your foot size is larger than the rest of the pattern size, Jalie explains how to sew a larger foot to the smaller pattern pieces. It's a shame none of my other children want this since Jalie comes in such a huge range of sizes. Hopefully my daughter will continue to enjoy this pattern for a few years. She is very excited at the thoughts of being able to wear this to school for the next pajama day. Here are a couple of pictures showing the neckband closer. I just turned the collar under on the inside and zig zag stitched it down. Jalie does suggest either serger or handstitching. I much prefer to sew by machine instead of by hand whenever possible. Fabric purchased at Hancock Fabrics. Purple rib knit from my stash. very cute! we call those onesies here, they were all the rage amongst younger kids for a while and you saw a lot out in public! Thanks Carolyn! That's interesting how they were popular--I bet my daughter would love it if I made this in other fabrics where she could wear them out and about. I was thinking today how it would be fun to make one in a knit jersey! I would totally wear this if it came in my size. Mind you, I know I'd never get around to making it. Looks so comfy and warm - not that I need warming up at the moment. I'm hanging out for Winter. Pam, you are in luck! This pattern comes in 22 sizes, size 2 all they way up into adult sizes!! :) I definitely need to make this in a lighter weight knit for my daughter because with it being footed and fleece, it is too hot for her. 22 sizes - WOW, that's value for money!!! I love Jalie patterns Pam! It's very practical since I can use the patterns for myself as well as my girls! They come on nice thick, sturdy white paper for tracing too. Their directions are very thorough and they have pictures too! I am so behind on my blog reading! This is fantastic! I didn't even realize it had pockets !!! I'm glad to hear that it sews up fast. Everything looks perfectly sewn too. The zipper and collar especially. I can't wait to make this up for K! Thanks Kristin. I really need to make this again, but maybe in a jersey knit because the fleece is really hot! She only puts it on occasionally now but not for long. :( I think a jersey knit is much better for warmer climates.